The highly popular Beauty Bazaar Warehouse SALE is coming back from 1 to 3 September 2016! You will enjoy up to 80% on branded fragrances, home fragrances, cosmetics and skincare at this sale. Participating brands include Clarins, Clinique, Estee Lauder, Issey Miyake, Kenzo, M.A.C, Lancome, Shiseido, SK-II and more! Dun miss it! 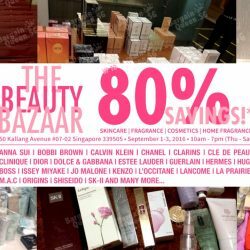 Also dun forget the Luxasia Mega Beauty Bazaar Warehouse Sale happening this weekend with up to 80% off popular brands like Burberry, Guerlain, Anna Sui, Lanvin, Decleor, Jurlique and more under Luxasia on sale ! 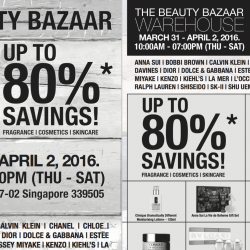 The highly popular Beauty Bazaar Warehouse SALE is coming back from 31 March to 2 April 2016! You will enjoy up to 80% on branded fragrances, cosmetics and skincare at this sale. Participating brands include Clarins, Clinique, Estee Lauder, Issey Miyake, Kenzo, La Mer, Lancome, Shiseido, SK-II and more! Dun miss it! 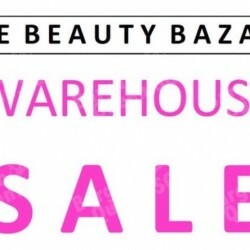 The Beauty Bazaar Warehouse SALE is coming back on 3 to 5 September 2015! You will enjoy up to 80% on branded fragrances, cosmetics and skincare at this sale. Dun miss it!